The trials of the Google Loon project would start soon in Ratmalana as the necessary equipment for such trials have arrived in the country, Telecommunication and Digital Infrastructure Minister Harin Fernando said yesterday. He said a team from Google to carry out the trials was expected this month. Sri Lanka entered into a partnership agreement with Google Inc. for the first mass deployment of Google’s high-altitude balloon-based Internet services in July last year. Though brief trials have been conducted in New Zealand and Brazil, this would be the first country Google’s Loon project would be launched officially. The agreement is valid for a period of one year. 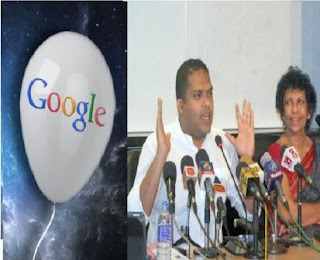 Information Communication and Technology Agency of Sri Lanka (ICTA) MD/CEO Muhunthan Canagey said if the trails were satisfactory, Sri Lanka would enter a fully-fledged agreement with Google Inc. for the deployment of the balloons subject to necessary approvals from the Defence, Finance and other ministerial level approvals. Minister Fernando stressed that the investment put in by the Sri Lankan government in the project would be the spectrum. Google Loon Fernando said 90 percent of the telecom services providers in the country are in favour of the project. The minister is expected to hold discussions with the country’s telecom services providers regarding the Google Loon project this week. The telecom services providers were said to have made representations to the President Maithripala Sirisena, expressing their concerns about the Google Loon project. Sri Lanka’s Internet penetration is estimated at 26 percent. Fernando pointed out that with the Goole Loon project, the government expects to make the Internet accessible to the entire population at affordable rates. “If 10 percent the population have Internet, the GDP grows more than 1.2 percent. This is the impact Internet could have on a country’s economy,” the minister said, referring to findings of a recent research. Fernando, Canagey and Defence State Minister Ruwan Wijewardene recently undertook a trip to Silicon Valley, San Francisco, USA and met with the top executives of tech giants such as Google, Facebook and PayPal. Fernando said the response from the US-based IT giants towards helping Sri Lanka to transform into an “innovation centre” was extremely forthcoming. Fernando said 90 percent of the telecom services providers in the country are in favour of the project. The minister is expected to hold discussions with the country’s telecom services providers regarding the Google Loon project this week. The telecom services providers were said to have made representations to the President Maithripala Sirisena, expressing their concerns about the Google Loon project. “If 10 percent of the population have Internet, the GDP would grow more than 1.2 percent. This is the impact Internet could have on a country’s economy,” the minister said, referring to findings of a recent research. Fernando, Canagey and Defence State Minister Ruwan Wijewardene recently undertook a trip to Silicon Valley, San Francisco, USA and met with the top executives of tech giants such as Google, Facebook and PayPal. Fernando said the response from the US-based IT giants towards helping Sri Lanka to transform into an “innovation centre” was extremely forthcoming.